My apologies to any of you awaiting your order. Have almost caught up with the backlog and this weekend should see the remaining items completed. Everything should be posted monday and tuesday. Once again, sorry if you have suffered a delay. It's OK Gerry, I get where Barry is coming from and think it is a very good idea to have button links on the various pages, aswell as the menu to hover over, it will give an alternative way of navigating around, thanks for the suggestion Barry, I want to make it as easy as possible to find things. Well spotted Si, I dd mess up a bit there with the Gnine wagons, will make it clearer when I update later, I knew it wouldnt be faultless, so thanks for pointing that out. Topic: what size Couplers ? Good news, well done Chris, Jeff and Gerry for taking on the task. Topic: Why do they stop making things you want? Well done Gerry, good to be reminded of these again, it's surprising how quickly they get forgotten and it's nice to read through again. The railway was dismantled after his death and if I remember correctly, most of the equipment went down to St Austell in Cornwall. Not sure what happened to it after that as the St Austell line must have closed about 20 years ago. KEG wrote: The Kraehwinkel Gn15 3-D- Printer works quite well. 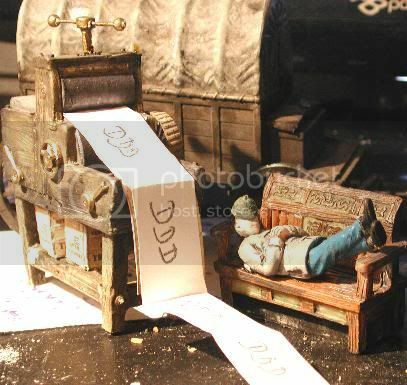 rue_d_etropal wrote: 3D printing in paper? how does this compare with services provided by other companies? It's a different process, it's more of a cutter than a printer really. The object is cut from a pile of paper by a blade on the print head. A lot cheaper on materials than the current 3D printing process. Topic: A Gnew guys 1:32 ramblings. Very impressive Alex, the finishing on the loco is superb.